« In Any Other Profession…? What a stupid decade we live in. How bad is it that I came into consciousness at a time when nothing good happens and nothing matters? 2000 through 2008: Fake celebrities on reality shows. Fake talents doing glorified karaoke on Idol. Fake money in banks. Fake President. Like the Emperor’s New Clothes, it’s been basically a bunch of naked people running around thinking they’ve got burqas on. 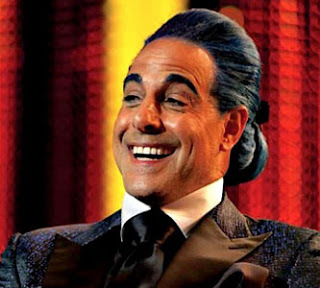 If you see the movie of The Hunger Games for no other reason, see it to watch Stanley Tucci in action. His performance, like the story of The Hunger Games, feeds a human need for truth and revelation. He plays Caesar Flickerman, the host of a 24-7 TV infotainment experience tracking the Hunger Games. [The Games are a Survivor-like show where teen tributes from a futuristic, dystopian United States battle to the death.] With great delight, his character interviews each tribute, fascinated by their personal stories, intent on reeling the audience into the drama. He laughs, he mugs, he chokes up for the camera, and everywhere his face repeats on massive screens. The tributes play along, glamorous and glib themselves, hoping for sponsors who will send gifts and aid during the most harrowing part of the Games. In other words, some help before they die. What we hunger for is truth. Art needs to hold the mirror up, and when it does, the reflection must not only look something like ourselves but also sound something like the nascent ideas rattling around our heads. It must feel something like that sensation deep in our guts–that sense of “Ech” when we watched Jon and Kate drag their eight children around like toys; when we watched a Jersey Shore partier debauch herself beyond disgust; when we see a bachelor fake a feeling for someone that might bring him further notoriety; when we watch a Kardashian pretend to have empathy for family they’ll soon betray. Based on the list of sins above, I must say of the last decade: What the hell have we been willing to watch all this time? I’ve been hungry for someone to point it out in bigger ways than a random punch line. What better way to call out this cultural phenomenon than with art? Thank you, Suzanne Collins, for Caesar Flickerman and The Hunger Games. No one likes a rant or polemic, especially if it’s just words in the wind. A preacher’s ire cools in the siesta of a Sunday afternoon, and politicians we ignore because we assume each has a scandal awaiting behind the curtain. We trust none of them to speak a word without hypocrisy. There must be action behind words. How to make a movement against the media? To control ourselves who consume it? That’s the question for the everyday consumer of TV as much as those who create it. Many things get me mad–racism, child abuse, hypocrisy–and when I remember my part in all these things–the compliance of silence, standing by, good people doing nothing, I make art. I sit on the sidelines and sketch what I see. Through Wendy Redbird Dancing’s eyes, I see a Dark Age of Noughts–a superficial time of bad reality TV and political gamesmanship, of greed-is-good beyond anything we’d dreamed prior, and I let her rant. As she rages, and as artists like Suzanne Collins make their commentary, I wonder if our culture is awakening from something close to a nightmare. Watching the film yesterday, I thought, There’s nothing like the art of film on the big screen to show us the trap and the lie of vanity and greed. If I’m hungry to speak truth and hear truth, what better way than through the eyes of a teen, a girl coming of age who has a lot of opinions and a lot of ‘tude. Give her quirks and a sense of humor; make her not only obsessed with Michael Jackson but in love with words, with Anderson Cooper, and making sartorial statements. Her message will go down easier than in the mouth of Lyn Fairchild Hawks who’s just another irritable citizen. Particularly irritable since she started her story over. Draft #25. The final final, I call it. But it’s okay. It’s all okay. I got a good dose of Hunger Games, I’m inspired to keep writing, and I know the story will out. This tells me we are all hungry, at the end of the day, for peace. Is there any reality TV you’ve seen that’s “for real”? What does it tell you, teach you, inspire you to think about? What reality TV depresses you, and why? Frustrates or irritates you? You are charged with pitching a concept of a reality show. What’s the premise? Why do people need to see this slice of real? Make a list of reality shows you would ban. Then pit all the characters against one another in your own satirical Hunger Games scene–a script with a to-the-death extravaganza that mocks our era of reality TV, remembering that satire attacks human vice and folly. So choose your humans well, those you find most full of vice and folly. Which actor in the movie best captured your image of a character from the book? What “real” did the actor portray that you were hoping to see on the big screen? Why is the character called Caesar Flickerman? After you explain connotations and symbolism, create new names for hosts of reality shows you love and despise. These new names should be full of connotation and symbolism, too. “What we hunger for is truth.” I certainly second that. Fiction, of course, tells the great lie to reveal the greater truth. It has to be that way because we humans innocently accommodate the things that tend to deteriorate life – or as you say – peace, with hardly a glance or a reflection. The trick is to give readers something they can comfortably relate to and slowly lift the pretty “rock” to reveal the snakes and scorpions living beneath it. Keep at it, Lyn. Wendy is a great device for that. Ay, there’s the rub–it’s all in the “trick” as you say of creating a world readers want to relate to, want to slip into, before we let the scorpion sting. The stuff that makes us all weep and writers obsess over in prose, it’s a beast to get onto the page in a way that’s readable and meaningful. The perfect combo.